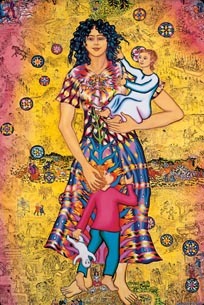 Front of card is a scaled reproduction of "Autobiography", the 1994 Epic oil painting by Barbara Mendes. This card in shining yellows and color-saturated patterns, shows a painting about the life of the Artist. The giant figure is the Artist when her children were babies; tiny scenes read left to right across the 8 foot by 6 foot canvas, tracing scenes of life before and after this period. Send this card to celebrate life passages!